Ahhhh....summer break. I've been out of school for two weeks now. So far, it's been a pretty happy-inducing/heart-mending vacation (which I desperately needed). 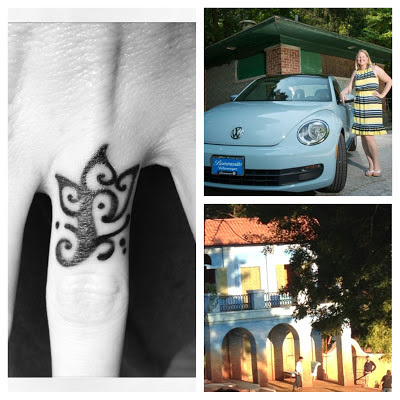 I got the initial tattoo on my finger redesigned into a lotus flower ("Even amidst fierce flames the golden lotus can be planted"), saw Shakespeare's Twelfth Night performed in Forest Park (my favorite St. Louis summertime event), and bought a new VW Beetle (an early 40th birthday present to myself). I've been spending my time enjoying leisurely breakfasts on the front porch, reading (finished two new novels about Scott & Zelda Fitzgerald), and cooking...working my way through the ever-growing stack of books on my nightstand and the never-ending list of recipes I want to try. This list includes most of the recipes on my new favorite food blog Yummy Books, where author/butcher/voracious reader Cara recreates dishes from various books. Food + literature = heaven! I read through all of the posts on Yummy Books last week and decided to try the strawberry pie inspired by Steinbeck's East of Eden (one of my favorite authors). Cara's recipe is unique because she adds basil and mint to the strawberries. Brilliant. 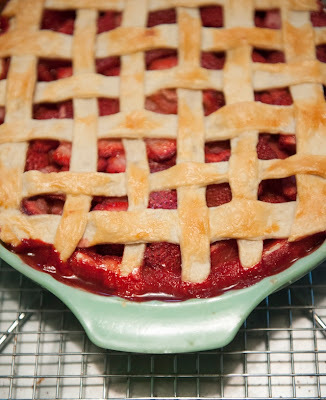 This isn't one of those strawberry pies in which the fruit is drowning in a thick, cloying syrup or gelatin. The fresh berries are simply mixed with sugar and herbs (I added some flour to thicken the juice as it baked instead of letting the berries macerate & then straining the juice out before filling the pie). 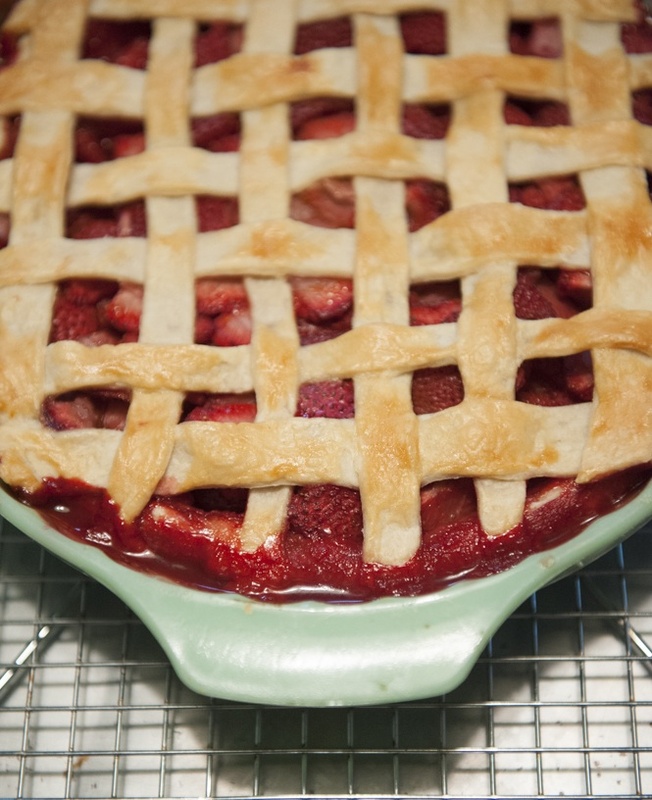 This is the first strawberry pie I've ever made AND the first time I've attempted a lattice top. The crust is way easier than I expected...and so pretty. To make the crust: Mix the flour & sugar in a large bowl. Using your fingertips or a pastry blender, cut the butter & shortening into the flour until you have pea-sized pieces. Mix in the water, one tablespoon at a time, just until the dough holds together. Cut the dough into two equal pieces & form each into a disk. Wrap one in plastic wrap & chill. Roll the other disk out & fit into a 9-inch pie plate. Brush bottom crust with beaten egg white. Chill while you make the filling. To make the filling: Mix everything together. Pour into chilled pie plate, then return it to the refrigerator. To assemble the pie: Roll out the chilled disk of dough bigger than your pie plate. Cut into 12 strips. Place 6 strips, evenly spaced apart, on top of your pie. Fold every other strip in half over itself. Add another strip of dough across the top, folding the strips back into place. 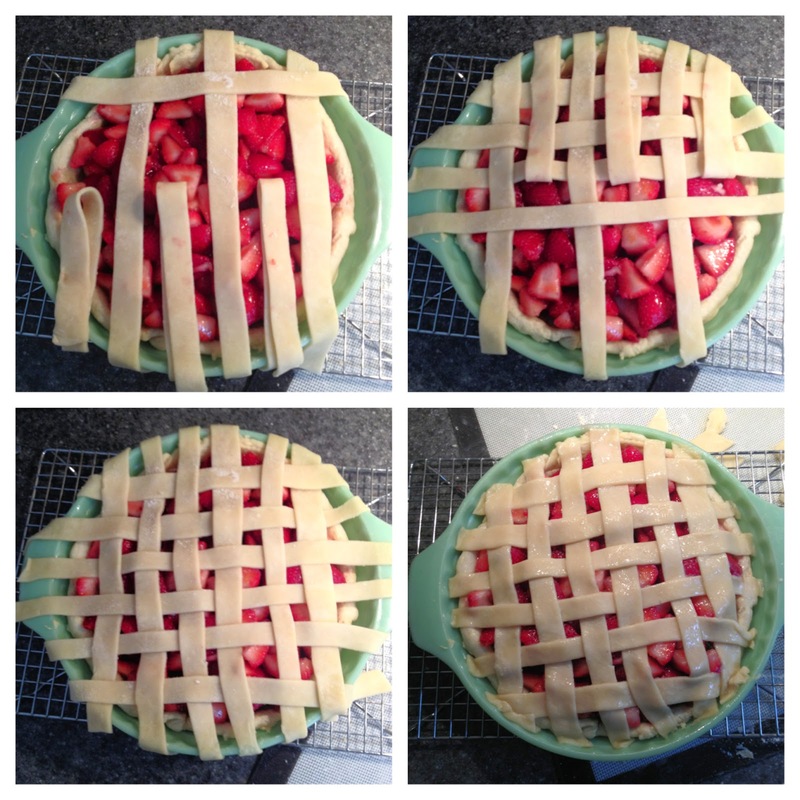 Repeat, alternating strips of dough, to form a lattice weave (see pictures below). Trim the strips & press the edges into the rim of the bottom crust. Brush top dough with beaten egg yolk. Bake for about 1 hour, until the crust is golden brown.